Preventing heart disease starts, in many cases, by lowering dangerous cholesterol levels while raising levels of the good form of cholesterol. Natural remedies for high cholesterol exist all around you, and in fact, are safer and more effective than medication in a number of ways. Factors like diet and exercise are the best natural remedies for high cholesterol, and anyone and everyone can take advantage of their benefits. According to the Centers for Disease Control and Prevention (CDC) 73.5 million American adults have high cholesterol and many rely on statins to help control it. Statins are drugs that help lower cholesterol levels in the blood; the problem is that statins can also increase the risk of type 2 diabetes and cognitive impairment. Now, not everyone can just stop taking medication when they embrace better lifestyle habits—so a new vaccine might be a better alternative. Research teams from the University of New Mexico and the National Institutes of Health have identified a new and possibly more effective cholesterol treatment. They’ve created a vaccine that can prevent high cholesterol by targeting a protein that’s responsible for controlling blood cholesterol levels. Without going into complex details, the vaccine essentially works by helping your body break down the receptors that low-density lipoprotein (LDL) cholesterol binds over when it’s flushed out of the body. It basically doesn’t allow the protein and receptors to do its job. So far only tested in mice, this vaccine has been more effective than statins and can hep people regulate cholesterol while they adopt healthier lifestyles—if they choose to do so. Having high cholesterol or a poor cholesterol profile—when LDL blood levels greatly outnumber “good” high-density lipoprotein (HDL) cholesterol—can result in atherosclerosis (hardening of the arteries) arterial blockages, high blood pressure and an increased risk of heart disease or stroke. Reducing bad “LDL” cholesterol and increasing good “HDL” cholesterol is the best way to achieve a healthy cholesterol profile and lower your risk of heart disease. There are different types of LDL cholesterol, and one in particular is responsible for settling along arterial walls. This form of LDL comes from refined, processed foods and making dietary and lifestyle adjustments. It’s the key component to naturally lowering and regulating high cholesterol. There are so many natural nutritional options that can help lower cholesterol that you might be surprised. Foods that lower cholesterol are really the most effective for reducing LDL and your risk of heart disease. Oats: Oats are a great source of fiber, and as mentioned earlier, fiber plays a key role in reducing cholesterol. Eating two servings of oats per day can lower cholesterol by over five percent in just six weeks—while being a very versatile food that can easily be included to your diet. Aside from the fiber, oats possess a compound called beta-glucan (which is found in the cell walls of cereals, yeast and bacteria) that surrounds and absorbs LDL to excrete it from the body. You can add more oats to your diet by eating them for breakfast or as a snack, adding them to a smoothie or using them in some of your favorite recipes. You can even make your own whole-grain by chopping up oats in a food processor! Beans: Beans are high in fiber and that means they’re good for your heart. Fiber latches on to LDL deposits and gets rid of them. To get the most benefit, make sure to drink plenty of water. 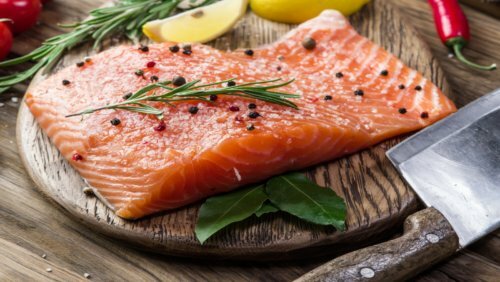 Salmon and other fatty fish: Omega-3 fatty acids are beneficial for your health in a number of ways; for one they can improve heart health by boosting HDL cholesterol levels. Eating fish twice per week, like salmon, herring, mackerel, or other omega-3 rich options can raise HDL cholesterol rather quickly. If you don’t like the taste or texture of fish, you could always try a fish oil supplement. Nuts: Like fish oil, nuts are a great source of healthy fats. The poly- and monounsaturated fats help to simultaneously lower and raise HDL cholesterol at the same time, resulting in vast improvements to your lipid profile. A study in the American Journal of Clinical Nutrition showed that people who ate 1.5 ounces of whole walnuts six days per week for a month lowered their total cholesterol by 5.4% and cut LDL specifically by over nine percent! Almonds, cashews and other nuts can offer similar affects. Vegetable Oils: Vegetable oils for high cholesterol and olive oil are also packed full of healthy fats that can improve your cholesterol profile. Olive oil (and other vegetable oils) is a central part of the Mediterranean diet, which is recognized for its amazing impact on heart health. Along with nutritional options, traditional Chinese medicine can also help lower cholesterol. There are a number of herbs used in Chinese medicine that can be effective treatments for naturally-lowering cholesterol and improving heart health. Of course, before using any of these herbs you should consult your doctor about any possible contraindications or side effects. May reduce atherosclerosis (hardening of arteries) and lower blood pressure. Moderate to vigorous exercise for 150 minutes per week can improve your cholesterol profile and lower total cholesterol. Consume a healthy diet that consists of more vegetables, fruit, whole grains, healthy fats, legumes and lean protein to lose weight. Even losing five pounds can have a big benefit on your heart health and lipid profile. Limit alcohol intake to one to two drinks per day. Avoid processed and fast food. Eat more good fats found in things like nuts, vegetable oil and fatty fish. “New vaccine could prevent high cholesterol,” Science Daily web site, November 10, 2015; http://www.sciencedaily.com/releases/2015/11/151110083034.htm. Gold, K.V., et al., “Oat Bran as a Cholesterol-Reducing Dietary Adjunct in a Young, Healthy Population,” National Institutes of Health web site; Western Journal of Medicine, 1988; 148(3): 299–302. Rajaram, S., et al., “Walnuts and fatty fish influence different serum lipid fractions in normal to mildly hyperlipidemic individuals: a randomized controlled study,” American Journal of Clinical Nutrition, 2009; doi: 10.3945/ ajcn.2009.26736S. Staker, L., “Chinese Herbs to Lower Cholesterol,” Livestrong.com, September 10, 2015; http://www.livestrong.com/article/134658-chinese-herbs-lower-cholesterol/. Griffith, R., “The New Low-Cholesterol Diet: Nuts,” WebMD web site, February 2, 2009; http://www.webmd.com/cholesterol-management/features/nuts-help-lower-bad-cholesterol.